It's time for another round of Death by Puppy, a semi-regular feature dedicated to the memory of anthropomorphised peluches whose tour of duty as companion/punching bag to Woody, our small but tenacious puppy, has come to an end. This time we feature two much loved but short-lived folks from land and sea. First up we have Kanga Poo. We would like to dedicate this to the memory of not one but two of the Poo family who perished at Woody's tiny jaws. The first friendly yellow marsupial met its maker literally overnight, its back ripped open along what we assumed was a dodgy workshop-sewn seam and Woody triumphant with a plastic squeaker in his mouth. We took the unprecendented move of returning Kanga Poo to the shop on the basis of poor seamstressness, noting that we only had a Jack Russell, not a rottweiler-velociraptor cross. 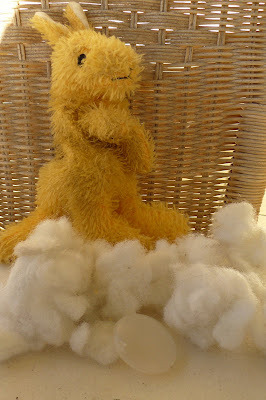 Sure enough within three days Woody (who it must be said greatly enjoyed playing with Kanga during their short time together) had once again ripped open Kanga Two's spine, removed the squeaker and decorated his bed in white fluff. Rest in Pieces, Kanga. Second up we have Annabel Crab, a small squeaky crustacean with threaded wool instead of a shell and big googly eyes that lasted about 48 hours. We think Woody ate them. Despite this Annabel fared quite well for a while. That was until Woody realised that he could unpick her shell row by row by standing on her back and yanking with his teeth. By the time the fourth row was gone Woody had enough wool to form a lassoo and Annabel's stuffing was stuffed. On behalf of ourselves and Woody we'd like to take a moment to thank these two loyal, short-lived servants to the cause. Nice one guys. You (temporarily) rocked.